Adventure Works sells assembled bicycles and biking accessories to retail stores. 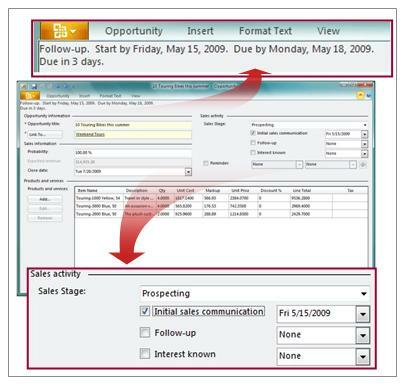 The sales manager for the company uses the Opportunity form in Business Contact Manager for Outlook to track a sale from the first conversation to completion. Weekend Tours, one of the stores that Adventure Works sells to, arranges cycling tours. With the approach of the biking season, more people are booking tours. Bob Gage, the tour director of Weekend Tours, has said that his company might be interested in purchasing touring bikes from Adventure Works. Review the Opportunity record that lists the bikes. In the Navigation Pane, under Business Contact Manager, click Sales. On the Opportunities tab, double-click 10 Touring Bikes this summer. Under Sales activity, the Sales Stage is Prospecting. During the Prospecting phase, Adventure Works might call Weekend Tours to get more specific details about the type of touring bikes they want, indicate when any follow-up action is needed, and verify that Weekend Tours still wants to purchase more touring bikes before moving the Opportunity to the next sales stage. Adventure Works customized the sales stages by specifying the activities for each stage. They also specified the duration of each activity. Tip: You can see the different sales activities for each stage by selecting a sales stage from the list. Change the duration of the Follow-up activity on all Opportunity forms. 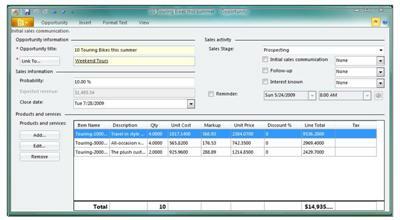 Under Sales Activity, select the Initial sales communication check box, and then select a date, or accept the default. At the top of the form, under the Ribbon, see a reminder that follow-up activity, the next activity in the prospecting stage, must be completed within two business days. 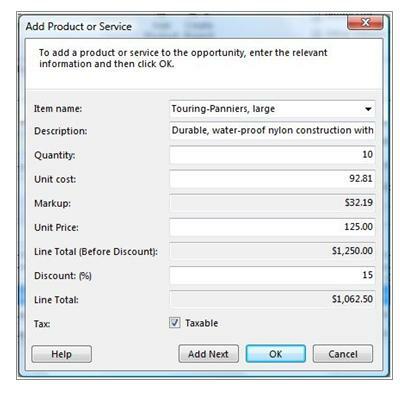 On the Ribbon, in the Customize group, click Sales Stages. 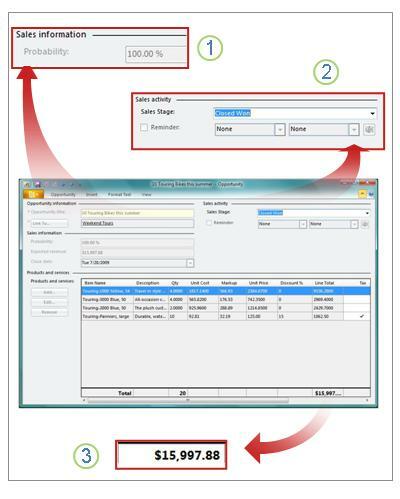 In the Modify Sales Stages and Sales Activities dialog box, under Prospecting, click Follow-up, and then click Edit. In the Edit Sales Activity dialog box, in the Duration list, click 1 day, and then click OK. Note: The reminder under the Ribbon is not updated until you clear, and then select the check box again. A reminder is added to the To-Do bar. After the initial sales call, John T. Donovan, the owner of Weekend Tours, said he might want to order four yellow Touring-1000 bicycles, four blue Touring-3000 bicycles, and two blue Touring-2000 bicycles. During a follow-up call, Mr. Donovan says that he wants to add 10 sets of touring panniers so that his customers can carry clothes and supplies with them. This is the first time he has ordered panniers from Adventure Works, so he gets a 15% discount on this purchase. Add the panniers to the Opportunity record. On the Opportunity form, under Products and Services, click Add. In the Item name list, click Touring-Panniers, large. In the Quantity box, type 10. In the Discount box, type 15, and then click OK. The panniers are added to the Opportunity record along with the price, including the 15% discount. Mr. Donovan agrees with the total price of $15,997.88. After delivery, the sale is closed. Click the Sales Stage list, and then click Closed Won. Figure 1: The Sales Probability is automatically changed to 100%. Figure 2: The Sales Stage is Closed Won. Figure 3: With the addition of the 10 panniers, the total value of the order is $15, 997.88.